Besides municipal source separated wastes, other organic wastes with a high dry-substance content can be processed for energy production. Contaminants only have a minor effect on the BEKON process. The robust wheel loader operation enables also the use of difficult input materials. Fermenters are constructed as water retaining concrete structures and are technically gas-tight. The wall and floor heating system (patented) is integrated into the concrete wall and floor sections during plant construction in order to optimise the organic degradation processes in the fermenter. The plant’s modular construction consisting of several fermenters allows for expansion if desired to increase the plant capacity. Maintenance costs for the overall plant are very low. Thanks to its patented process, BEKON does not need to use any stirring equipment in the fermenter. The hydraulic hatch of the fermenter is opened upwards to ensure that the integrated inflatable sealing cannot be inadvertently damaged while the wheel loader is loading or unloading. BEKON plants are regarded as extremely reliable in their operation because of the robust technology and sophisticated construction. BEKON’s technological leadership is established by these factors. BEKON provides proven and reliable technology which can be ideally employed alongside existing composting facilities. The existing infrastructure with wheel loaders can be used ideally. No pumps or mixers are necessary for operation. The material for fermentation generally requires no pre-treatment. For these reasons the machine and personnel operation costs are less expensive compared to the wet fermentation process. The controlling system is designed for fully automatic operation; it clearly visualises the entire fermentation process, including the percolation cycle, temperature regulation and production of the CHP modules. 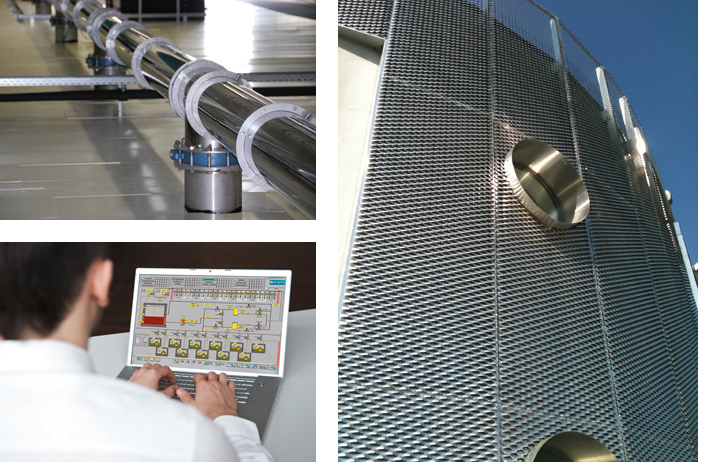 To control the various process parameters is easy and user friendly. Moreover the plant can be comfortably monitored worldwide via the Internet using a mobile device (e.g. smartphone or iPad). The complex safety system integrated in BEKON plants is patented and includes a patented fermenter flushing process. This process ensures that the transfer from the methane atmosphere in the fermenter head space to the air atmosphere (before emptying the fermenters) and vice versa (after filling the fermenters) can be performed safely. Therefore a dangerous air-methane mixture can never form up inside the fermenter and odour emissions are avoided. Moreover the fermenters are operated at a slight overpressure (20 mbar). Overall the innovative and patented developments of BEKON technology facilitate to maintain high technological standards while allowing the operator to enjoy maximum safety. BEKON’s customers profit three times by feeding electricity and heat into local grids and by producing and marketing quality composts. BEKON fermentation plants show above-average gas yields which particularly makes them cost-effective. The BEKON process is flexible with respect to the use of biogas. Besides being suitable for use in CHP modules, it can also be used as biomethane – following treatment of the biogas to bring it up to the quality of the natural gas grid. This means that the biomethane can be fed directly into the natural gas grid or used in compressed natural gas vehicles.